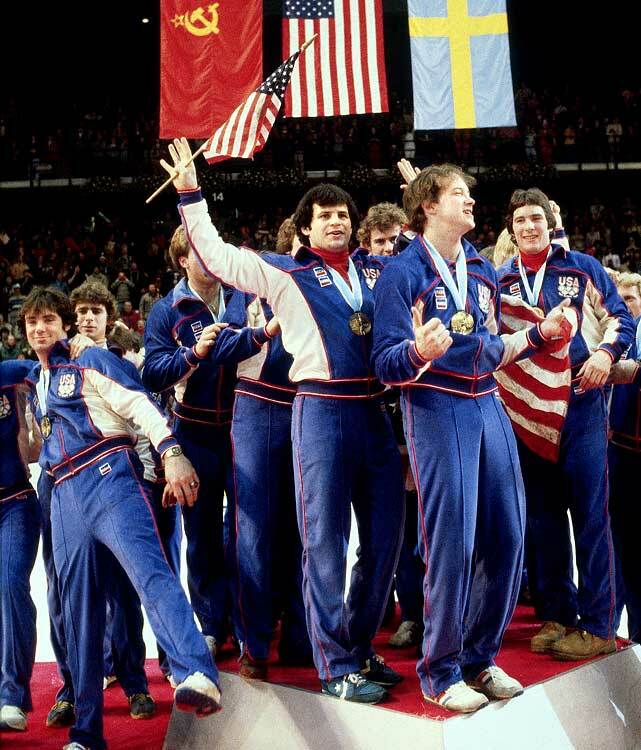 From the SI Vault: "The Golden Goal," how the 1980 U.S. Olympic hockey team pulled off its Miracle On Ice win over the vaunted Soviet Union en route to the gold medal in Lake Placid. This article originally appeared in the March 3, 1980, issue of SPORTS ILLUSTRATED. 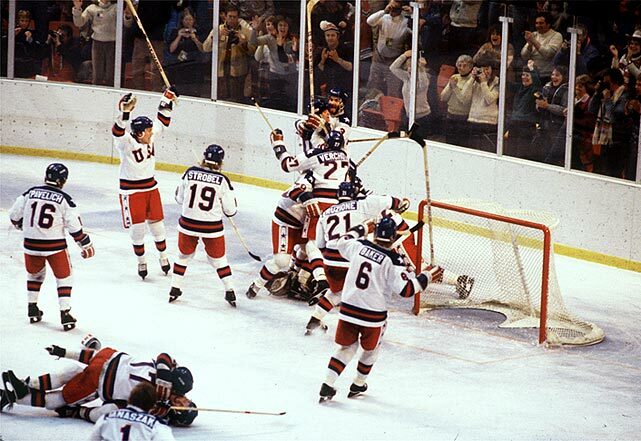 We are republishing it in honor of the 35th anniversary of the U.S. team's landmark upset. 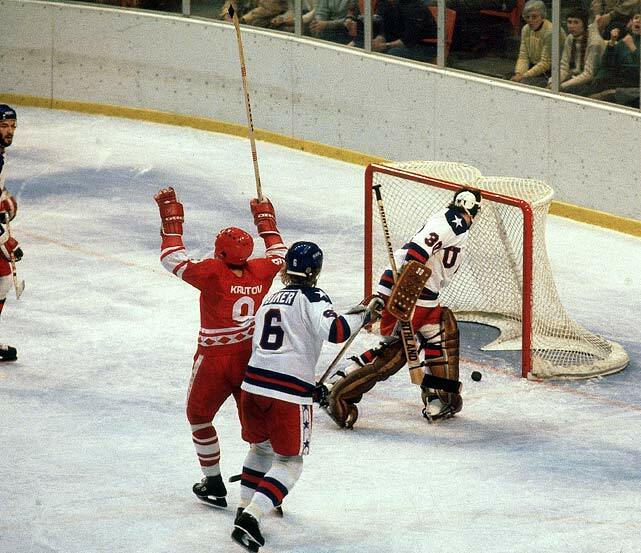 The U.S. went bonkers when Mike Eruzione's shot beat Vladimir Myshkin for the winning goal as America's Team stunned the once invincible Soviets en route to the Olympic title. 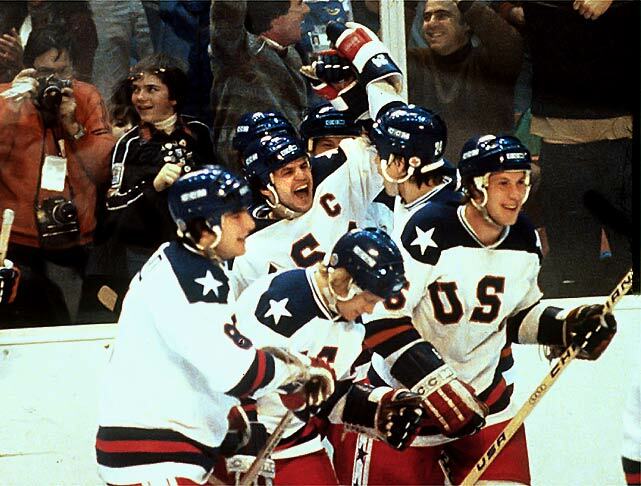 For millions of people, their single, lasting image of the Lake Placid Games will be the infectious joy displayed by the U.S. hockey team following its 4–3 win over the Soviet Union last Friday night. It was an Olympian moment, the kind the creators of the Games must have had in mind, one that said: Here is something that is bigger than any of you. It was bizarre, it was beautiful. Upflung sticks slowly cartwheeled into the rafters. The American players—in pairs rather than in one great glop—hugged and danced and rolled on one another. 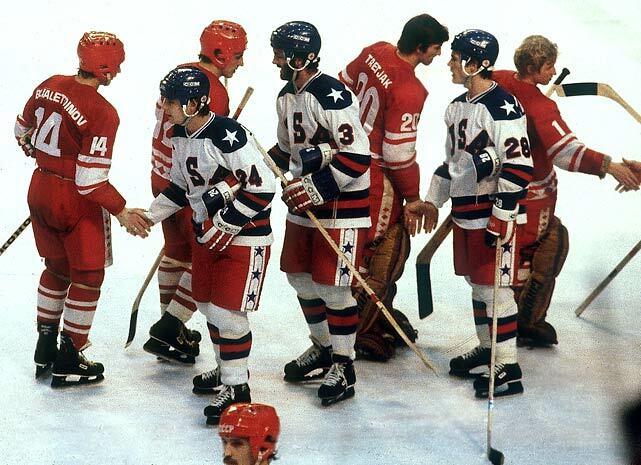 The Soviet players, slightly in awe, it seemed, of the spectacle of their defeat, stood in a huddle near their blue line, arms propped on their sticks, and waited for the ceremonial postgame handshakes with no apparent impatience. There was no head-hanging. This was bigger, even, than the Russians. In the streets of Lake Placid and across the country, it was more of the same. A spontaneous rally choked the streets outside the Olympic Ice Center, snarling bus traffic for the umpteenth time since the start of the Games. A sister of one of the U.S. hockey players—in between cries of “The Russians! 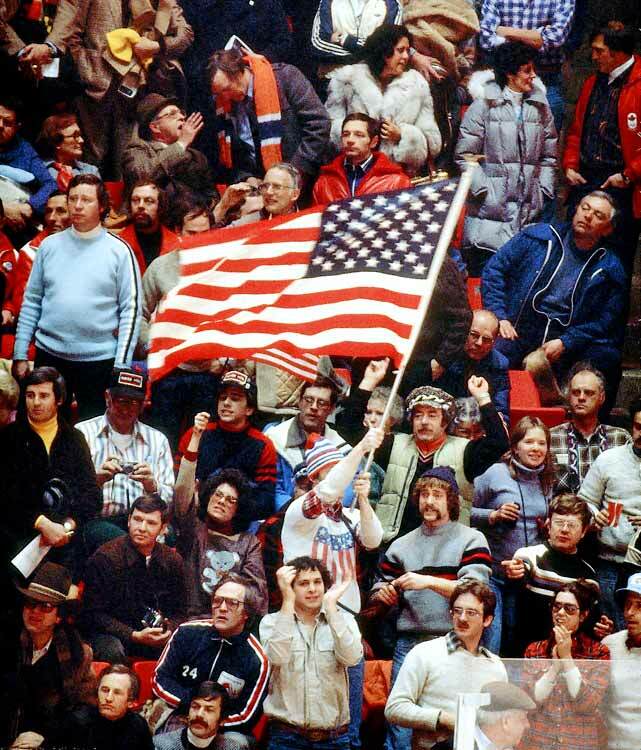 I can’t believe we beat the Russians!”—said she hadn't seen so many flags since the ’60s. “And we were burning them then,” she added. Great as it was, there was still a little matter of the gold medal to take care of. Going into Sunday’s game against Finland, it was possible for any of the four medal-round teams—the U.S., Finland, Sweden, the U.S.S.R.—to win the gold. Despite its astonishing string of upsets and its 5-0-1 record, the U.S. wasn’t even assured of a bronze. But America’s Team had come too far to lose. They didn’t, but it wasn’t easy. Finnish Goalie Jorma Valtonen made 14 stops in the first period as Finland took a 1–0 lead—the sixth time in seven games the Americans had surrendered the first goal. Steve Christoff tied the game in the second period, but the Finns scored a power-play goal two minutes later. So, after two periods, this U.S. squad found itself in almost the same position that another American Olympic hockey team had been in 1960 at Squaw Valley. After having beaten the Soviets the day before, the ’60 team was trailing Czechoslovakia 4–3 with one period to play. The U.S. players then came out and scored six unanswered goals. One of the leaders of that comeback was Billy Christian, and 20 years later it was his son, David, who sparked the decisive rally. With just under 2½ minutes gone in the third period, Christian broke up-ice and slid a pass to Phil Verchota, who broke around the defense and beat Valtonen to tie the game at 2–2. Then, at 6:05, Christian backhanded a shot from the point that the ubiquitous Johnson picked up behind the net and passed out front to Rob McClanahan. 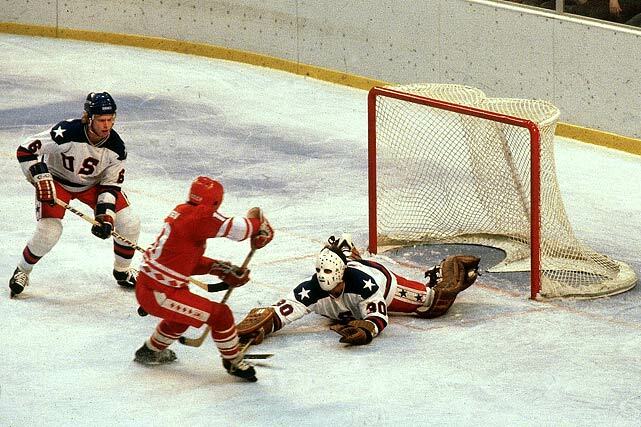 After waiting calmly for Valtonen to make the fatal first move, McClanahan slipped the puck between the goaltender’s legs for a 3–2 U.S. lead. The drama built as the Americans were called for three penalties between 6:48 and 15:45 and the Finns pressed the attack. Finally, with 3½ minutes to play, the U.S. scored perhaps its most spectacular goal of the entire tournament—a shorthanded one at that. Christoff slammed a startled Finn against the boards and centered a pass to Johnson. 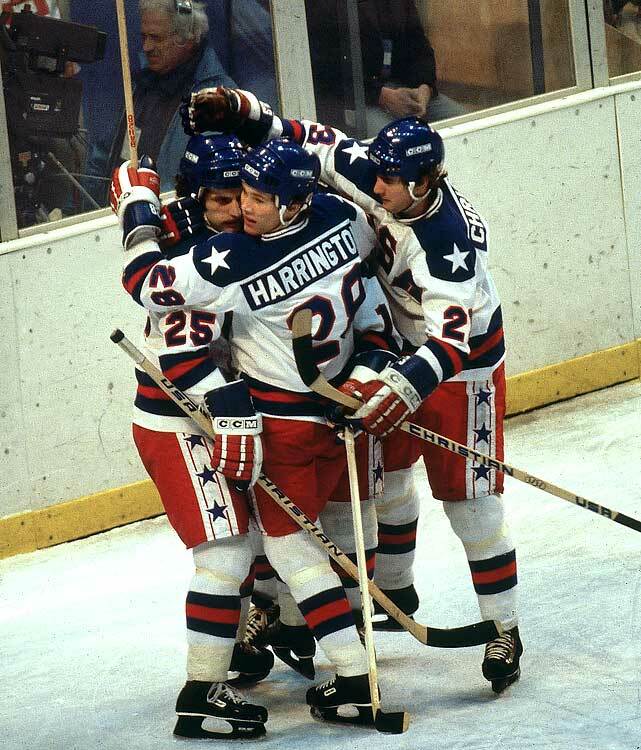 Mark Johnson, the top U.S. goal scorer, exulted after rapping a rebound past Valtonen for the clinching goal in the 4-2 triumph over Finland that assured the gold medal. • You’re playing worse every day, and right now you’re playing like the middle of next month. • Gentlemen, you don’t have enough talent to win on talent alone. • Boys, in front of the net it’s bloody-nose alley. • Don't dump the puck in. That went out with short pants. • Throw the puck back and weave, weave, weave. But don’t just weave for the sake of weaving. • Let’s be idealistic, but let’s also be practical. • You can’t be common because the common man goes nowhere. You have to be uncommon. The U.S. hockey team was anything but common. Before the previous week’s upset win over Czechoslovakia, Christian sat in the locker room and secretly fashioned something out of a cardboard Budweiser packet. When he put on his helmet, there were a set of wings and a tail sticking out of the airholes. “Boy, am I going to be flying tonight,” Christian announced. The U.S. players performed fearlessly, and the public ate it up. Even before the Americans beat the Soviets, Lake Placid restaurant managers sent over complimentary bottles of wine, and New York State Troopers asked for autographs. At one point, Silk’s mother, Abigail, who was housed with 40 other hockey parents and relatives in an abode they called the Hostage House, was riding a bus when she heard a young man tell the girl he was embracing that he was on the hockey team. “Really? And who are you?” Mrs. Silk asked, cruelly. “I'm Dave Silk,” he said, undaunted. “I'm Dave Silk’s mom,” she replied. It was electric. Craig, superlative throughout the Olympics, gave up two first-period goals but made 16 saves, most of them tough ones. Indeed, he kept the U.S. alive. Then, with three seconds remaining in the period, the U.S. made the key play of the game. Christian took a 100-foot slap shot from beyond center ice that goaltender Vladislav Tretiak let rebound off his pads. Johnson, busting toward the net, weaved through the two Soviet defensemen and picked up the puck. He feinted, dropping his shoulder as if to shoot, and Tretiak went to his knees. Johnson pulled the puck back, moved to his left a bit and slid the puck behind Tretiak and into the net just before time expired. That was all for Tretiak, who was promptly yanked from the game in favor of Vladimir Myshkin. 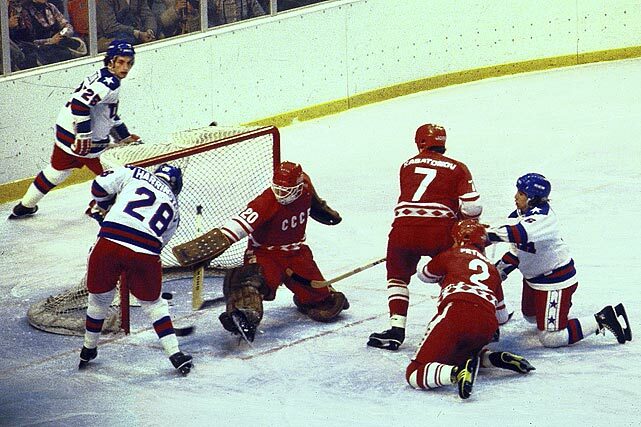 And when Aleksandr Maltsev made it 3–2 at 2:18 of the second period, that was all the scoring for the Soviets. All told, the U.S. outscored its opponents 27–6 in the second and third periods, testimony to the team’s depth and conditioning. Charged up by the chants of “U.S.A.! U.S.A.!” the Americans tied the score at 8:39 of the third period. Silk sent a pass through two defensemen to Johnson, who picked the puck off a Soviet skate and fired it under Myshkin. 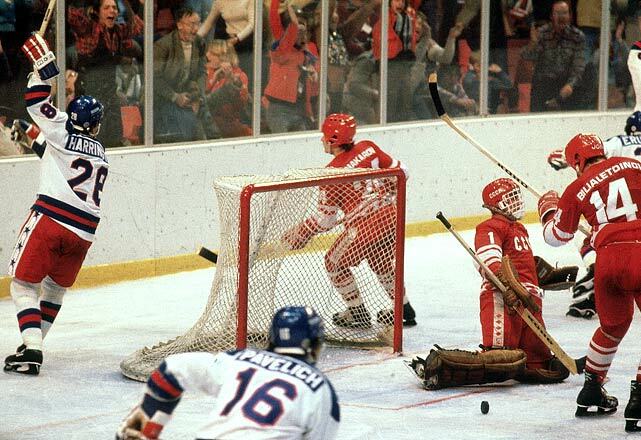 The game winner came 1:21 later, Eruzione beating Myshkin through a screen. Eruzione means “explosion’ in Italian, and his goal sent repercussions rinkwide, nationwide, indeed, worldwide. 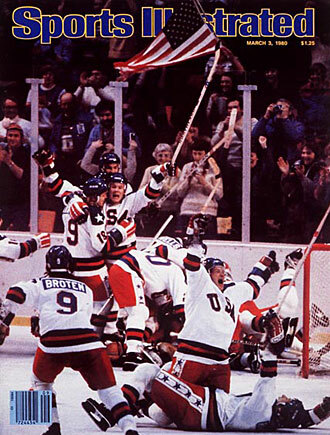 On February 22, 1980, the Miracle on Ice took place during a medal-round men's ice hockey game between the United States and Soviet Union at the Winter Olympics in Lake Placid. The young American team faced whom many considered to be the best hockey goaltender in the world at the time, Vladislav Tretiak. The Soviets were captained by legendary winger Boris Mikhailov, whom Herb Brooks told his players resembled Stan Laurel of the comedy team Laurel and Hardy, in the hopes of removing any fear of facing him. 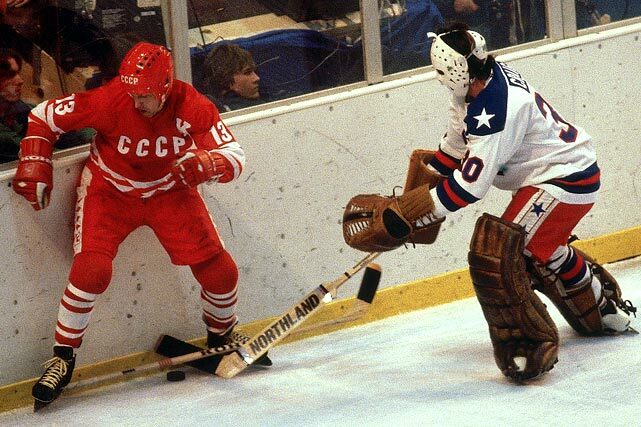 Vladimir Krutov deflected a slap shot by Aleksei Kasatonov past U.S. netminder Jim Craig to give the Soviets a 1-0 lead halfway through the first period. Buzz Schneider (left) scored for the United States to tie the game less than five minutes later. After the Soviets regained the lead 2-1 on a goal by Sergei Makarov, U.S. goalie Jim Craig stepped up his play between the pipes. Craig faced 18 shots in the first period alone. In the final seconds of the first period, Dave Christian fired a slap shot on Soviet goalie Vladislav Tretiak from 100 feet away. 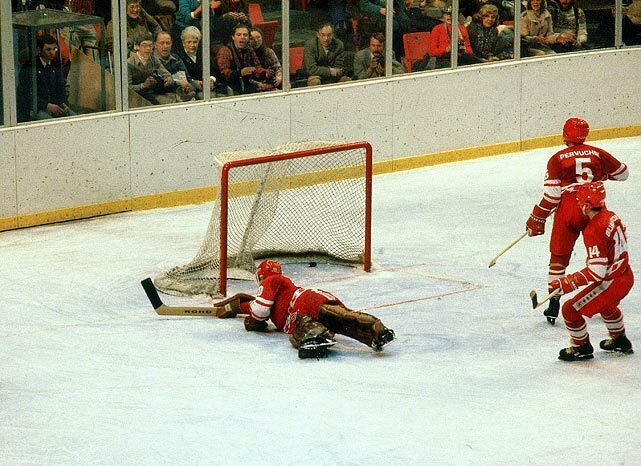 Tretiak saved the shot but misplayed the rebound, which was picked up by Mark Johnson who scored his first of two goals in the game. Soviet defensemen Vasilij Pervuchin and Zinetula Biljaletdinov hadn't noticed Mark Johnson move in for the rebound as they watched the clock tick off the last few seconds. Johnson fired the puck past a diving Tretiak to tie the score 2-2 with one second left in the period. Soviet coach Viktor Tikhonov replaced Tretiak with backup goaltender Vladimir Myshkin for the start of the second period, a move which shocked players on both teams. The Soviets dominated play in the second period, outshooting the Americans 12-2, but scored only once, on a power play goal by Aleksandr Maltsev. With the game tied 3-3 on a Mark Johnson power play goal, the U.S. struck again just 1:21 later, at the halfway point of the third period, on a shot by captain Mike Eurzione. Eruzione, whose last name means eruption in Italian, gave the U.S. team it's first lead against the Soviets with exactly ten minutes left to play. 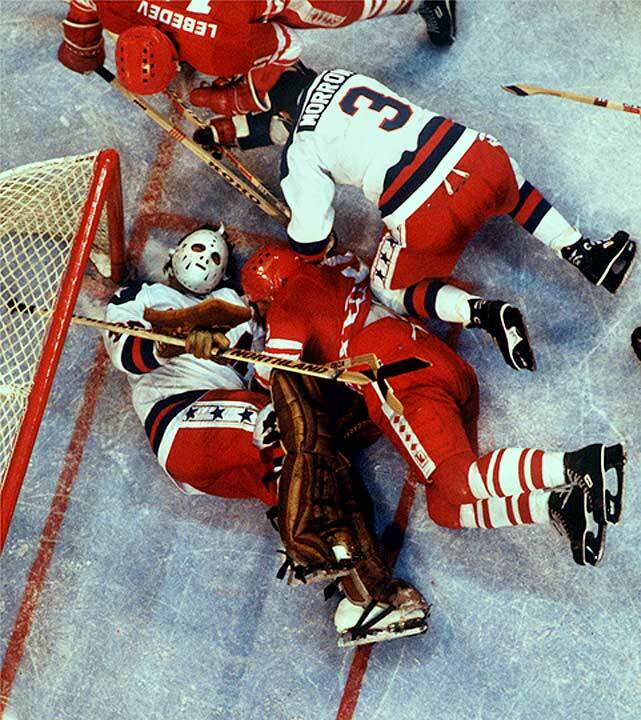 The Russians attacked furiously following Eruzione's goal, but Jim Craig held strong. 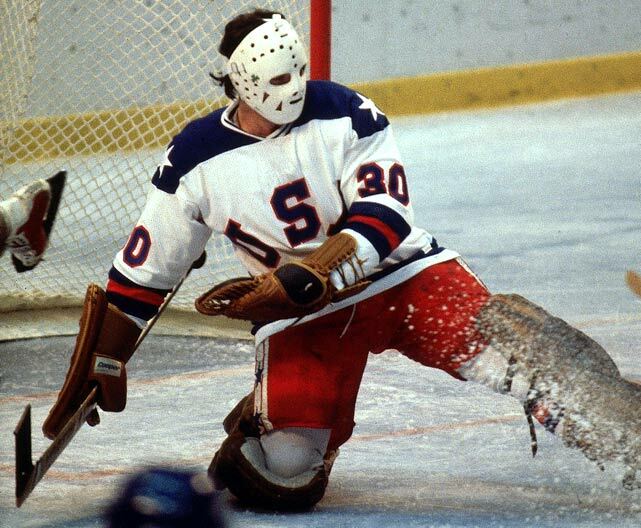 In the end, Craig stopped 36 of 39 shots on goal as the U.S. defeated the Soviets 4-3. 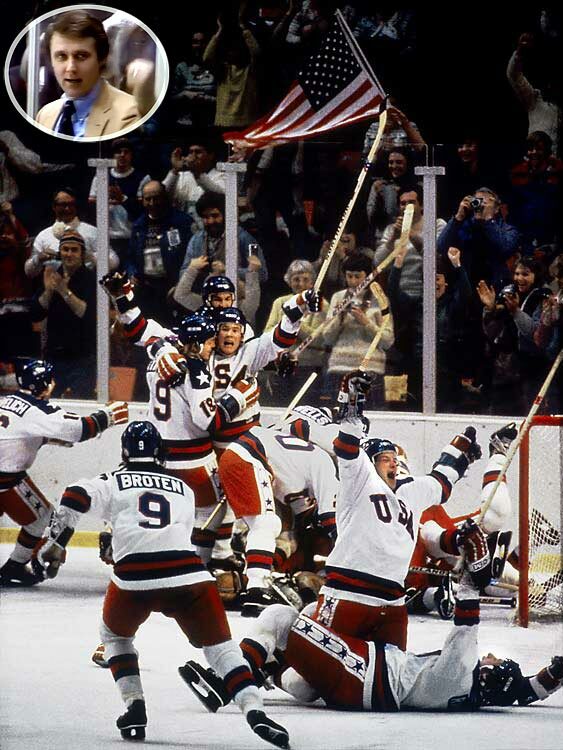 Sportscaster Al Michaels, who was calling the game on ABC, picked up on the countdown in his broadcast, and delivered his famous call as time ran out: "Do you believe in miracles? YES!" The Field House was packed to capacity (8,500) as many in the home crowd waved American flags throughout the game. Players from both teams meet at center ice to shake hands following the game. 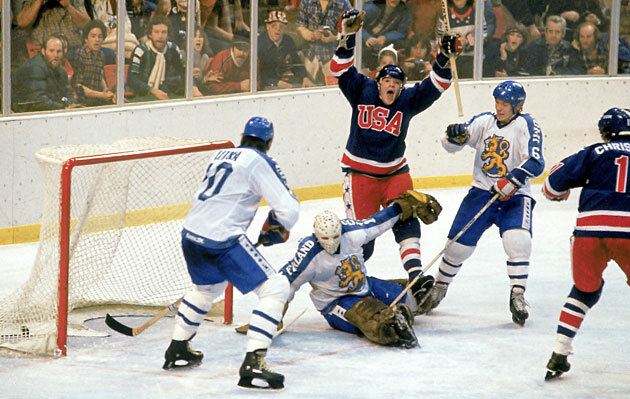 Many forget that the U.S. still needed to defeat Finland to secure the gold medal, and came back from a 2-1 third period deficit to win 4-2, thus finalizing the Miracle as such.